Each traditional culture has their own fermented food that they have been making and consuming regularly for many years. These foods were created through years of experimentation, due to seasonal changes, not having a fridge or freezer to help food last longer, as well as realising that some foods are best consumed only fermented. Philippines – they ferment coconut to make coconut vinegar. They also ferment green papaya to use as a condiment. Japan – they ferment soy beans to create soy sauce, tempeh and natto. They also ferment fish. Germany – they ferment cabbage to create sauerkraut and other pickled vegetables. 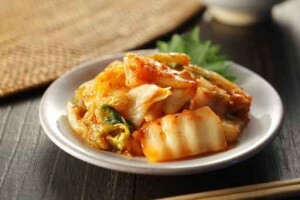 Korea – they create kimchi which is fermented cabbage and spices. 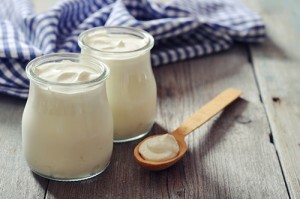 Other examples of fermented foods include kefir, sourdough breads, yoghurt and apple cider vinegar. Through the fermentation process, microbes in fact predigest the food for us, making everything more bioavailable and putting less stress on our digestive system. But this is certainly not the only benefit when it comes to digestion. Another benefit of fermentation, which aids digestion, is the amount of beneficial bacteria that assists to replenish our guts. One of the most important elements of fermented food is that it assists in acidifying our gut, which is actually ESSENTIAL for proper digestion of food. The pH of your stomach needs to be highly acidic, roughly between 1.3 to 3.5. If the pH is alkaline, we cannot digest our food efficiently, leading to microbial infections and illnesses. The stomach achieves this by secreting hydrochloric acid in order to assist in the breakdown of carbohydrates, fats, proteins and more. Something as simple as apple cider vinegar (which is a fermented food), contributes hugely to balancing the pH of our gut. I have had many clients who no longer need proton pump inhibitors (such as Nexium), because they implement a proper dietary plan and introduce fermented foods including apple cider vinegar. It is important to be guided by a holistic practitioner to do this. Not only this, the probiotics within fermented foods and bacteria within us produce digestive enzymes that are essential when breaking down our food which help to make the nutrients available for proper absorption. Strains of bifodobacterium, found in many fermented foods assist in the digestion of plant matter. For example, they have been found to actually digest natural components in cruciferous vegetables (broccoli, Brussel sprouts, cabbage) such as glucosinolates. The assistance in digesting plant matter allows us to gain the most benefits from these detoxifying, healing foods. I encourage individuals to avoid the ‘modern day’ wheat and gluten because of the damaging modifications that have been made to it – read more here. When it comes to an organic sourdough made with a traditional wheat grain like emmer wheat or einkorn, it can be highly digestible and become a nourishing food due to the fermentation process that occurs in sourdough making. Traditionally, sourdough is created after at least 48 hours of fermentation. Studies have in fact shown that sourdough can sometimes be tolerated by even those with coeliac disease – which to me is mind-blowing! Read more about the benefits of sourdough here. The potential susceptibility of getting an infection, such as Salmonella in the human gut is reduced when individuals consume fermented foods. When these infections are present, digestion is hugely compromised and this is evident through diarrhoea, vomiting and constipation. It helps to fight against potential pathogenic microbes as well as help to increase the intestinal barrier which is essential for a well-functioning immune system. Not only do fermented foods and their incredible probiotics actually help you get the most out of your food, experience less bloating, diarrhoea, gas and constipation, the microbes actually PRODUCE nutrients, particularly B vitamins in your gut! Many of us are deficient in vital nutrients as we have disrupted gut bacteria, known as dysbiosis. The best way to correct this is by eating fermented foods. 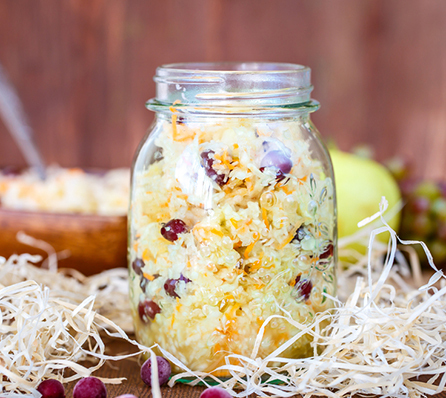 For a simple sauerkraut recipe, click here. 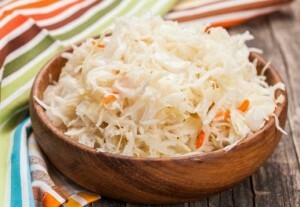 Fermented foods are vital for a healthy body, especially if you have digestive issues. It is important to always start with a small amount and then increase it gradually. For more information on fermentation and cultured foods click here.